Have you ever heard of a King without a Kingdom? Well, today you learn about Stanislas Leszczynski, the king of without a Kingdom. He resided in a place called Nancy that was built in 1752 to 1756 under an architect known as Héré. The carefully conceived plan comprised of 3 squares built with artistic talent befitting a royal residence. 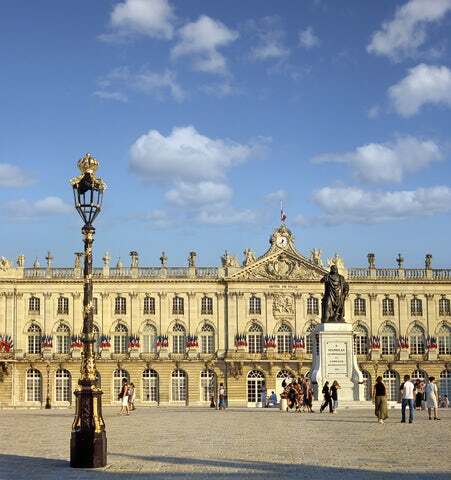 To add to the allure of the town, the prestigious architecture of Nancy features triumphal arches, statues, fountains 3 squares, a town hall, courts of law, palais des Fermes, botanical gardens, public gardens and many more. Another intriguing feature of the town is the Alliance Square, which was formerly known as the Saint Stanislas Square. It features a Baroque Fountain that was made by one of the town’s foremost architect, Cyffle. The fountain is a symbol of the unity of the Austro-Hungarian Empire and France in 1756. The interesting story behind this UNESCO listed World Heritage Site is enough to make you visit the town. Its beautiful architecture is an even better reason to visit it!